Delicate border of spring flowers; hand painted watercolors; bonus wreath. Just perfect for spring! 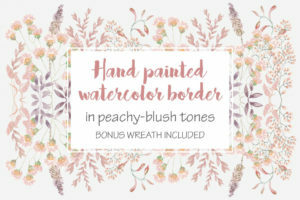 Hand painted watercolor clip art border of soft, delicate blooms in mixed pastel shades. Create beautiful wedding and other stationery with this clip art. Also great for scrapbooking, decoupage, labels, logos and all paper-based crafts. The listing includes a wreath in the same flowers. 1 zipped folder is immediately available for download following purchase, containing the border and the wreath files (JPEG and PNG) – 4 files.